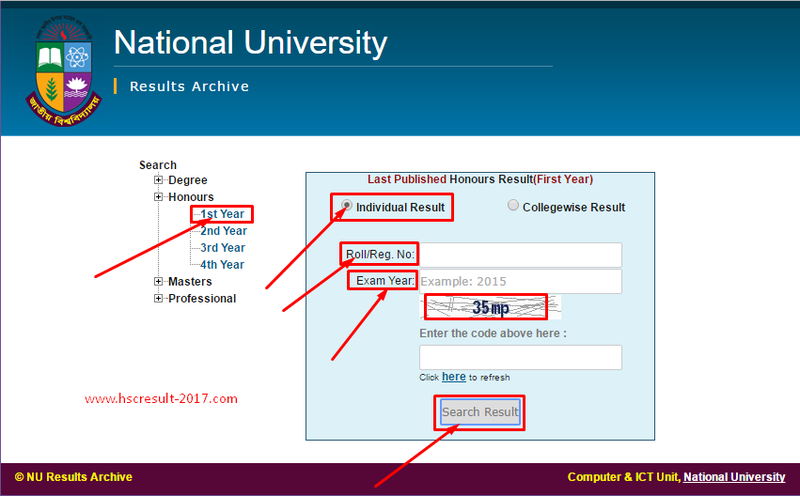 How To Get NU Honours 1st Year Result 2019 Online. You can check Honours 1st Year Result Online here from this page. At first Input your Roll Number or Registration Number here to check your Honours 1st Year Exam Result. Do you want to check Honours 1st Year Result 2019 Online? So this article for you. Because here I have shared the full process for collecting NU h1 Result 2019 for the valuable readers of Edu And Result. Let’s read the full article to get your result very easily. Do you know every student can get their JSC Result, SSC Result 2019, Honours and others Exam Result from online? I think maximum students do not know clearly about this. Here we have discussed clearly this. Read the full article to know about this most useful thins. Here you can learn how to get NU Honours 1st Year Result 2019 for National University of Bangladesh. Follow the easy steps to check NU Honours 1st year exam result of this year 2019 without any problem. So let us come to the main point. How to get Honours 1st Year Exam Result 2019 online method. The Internet is the common thing in this time of every country. No any person, who do not know about online/internet. Most of the mobile phone has internet features. Nowadays Android smartphone does not a thing without internet. They everyday use Facebook, WhatsApp, and many others. So online (internet) way is the easy and costs free way of others way. So if you interested to get National University Honours Result 2019 Online, so follow these easy steps below. Firstly you have needed to open your internet browser from your Android smartphone or Computer. Then log in on Official website of Bangladesh National University. Do you know this official website address? This is www.nu.ac.bd/results . So visit the official website first. After visiting this website. Then you can get a window like below. Now click on the plus (+) icon on the “Honours” option. You can get four pop up menu. First is “Nu Honours 1st Year Result 2019”. So you have to click on this “1st Year Result” option. Then you can get a new box. This box helps you to see your individual and College wise Result. If you want to collect your Honours 1st Year result 2019 only, so you have to “Click” on “Individual Result” option. This box wants your information. Click On “1st Year Result” option. Enable the “Individual Result” option. After some time later you can get your nu honours 1st Year result 2019 from online. It will be taken a long time for the huge visitors on the official website. I hope you guys successfully understood and successful to collect your Honours 1st Year Result 2019 online. Thank you so much for visiting our website. If you like this article so try to share this. Thanks again.